In 1805, the Exchequer assigned a group of land surveyors to find Denmark's best farming land. They found it just beyond Niels Nielausen's farm No. 16 in the village of Karlsunde, south of Copenhagen. This fertile, well-drained and slightly chalky soil was given the highest rating of grade 24" and became the standard for grading land in Denmark in the period 1806-1822. The intention was to introduce a new land register, and a new tax base determined by the soil's composition and yielding capacity of grain, grass or hay. 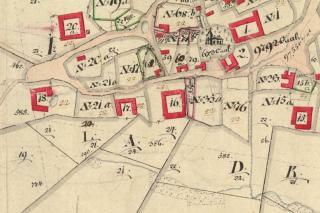 The new land register came into effect in 1844. " The land surveyors reported: According to these tests, we find the soil from Karlslunde Mark from freeholder Niels Nielausen's field, south of the east end of his farmhouse, to be of such an excellent standard that further surveys of other parts of the country of the soil that is to serve as the standard for Land Register taxation would be unwarranted". As an appendix to the Land Register of 1844, the land surveyors drew a highly detailed cadastral map of every single village in Denmark. Today, these maps provide important research material for archaeologists, historians and geographers. They can be used to trace lost Medieval villages, the ancestral names of farmers or survey the historical landscape. "